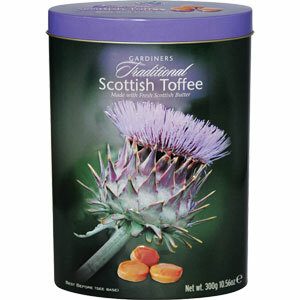 Delicious salted caramel shortbread in a handsome thistle tin, fourteen cookies, 9.8 oz. Salted Caramel - now in delicious shortbread! 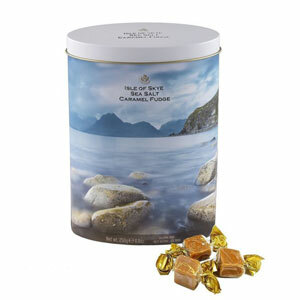 There are plenty of pieces of salted caramel here - and the beautiful octagonal tin holds fourteen delicious cookies inside. 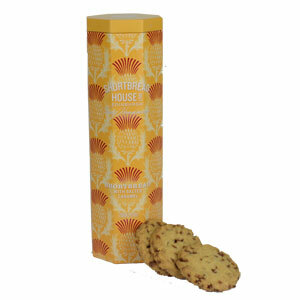 Made by the award winning bakers of The Shortbread House of Edinburgh for you to enjoy or give as a gift. 9.8 oz. 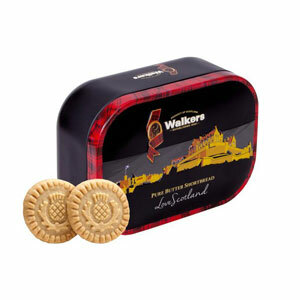 of shortbread in the 9.5 inch tall tin. Ingredients: Wheat flour, butter with salt, sugar, salted butter caramel(11%)(sugar, salted butter, glucose syrup, sweetened condensed milk, water), ground rice, rapeseed oil, sea salt. 210 calories for two cookies, 26 grams of carbohydrates, 9 grams added sugar. SHORTBREAD HOUSE is a small, family run bakery based in Scotland's historic capital city of Edinburgh. Anthony Laing and his wife Fiona acquired the business in 1989. Since then, it has grown from a small customer base in Scotland to having customers throughout the UK and abroad. Anthony comes from a family with a strong baking tradition. His father is Lord Laing who was chairman of United Biscuits. Shortbread House does not aspire to become a large conglomerate, preferring to concentrate on a niche market where quality, rather than quantity, is emphasized. Their customer base is predominantly the independent retail trade such as delicatessens, garden centres and department stores such as Fortnum & Mason, John Lewis and Harvey Nichols. All products are genuinely made by hand, so their taste, texture and appearance are quite different from the mass produced brands. Quality is baked in by a small team of skilled bakers using the very best quality ingredients. All products for Scottish Gourmet USA are made to order to ensure you receive the products as fresh as possible. I gave these cookies to my mother and she loves them! The tin is really pretty too.